A few weeks ago we had a wedding reception for my brother, Joey, who got married in May down in Texas. He is in the army and is stationed in El Paso, TX. The family came up to meet our family and it was a wonderful time. My dad rediscovered gyros a few years ago when he found a gyro shop in downtown Appleton, WI called Gyro Kabob. It is a delicious little restaurant with authentic gyros, greasy fries, and cheap prices. Even my mom, who is a little picky when it comes to what she likes to eat, thinks it is amazing. Needless to say Joey’s wedding reception was the perfect excuse for my parents to introduce the rest of our family and our new Texan relatives to Gyro Kabob. The gyros were a hit – so popular we ran out of pita bread! This left us with a few bags of gyro meat. Jason and I were lucky enough to bring some back with us. I recently defrosted some of the meat and made this pasta dish with it. Jason has devoured most all of it in the past few days. Since gyro meat is just shaved and seasoned lamb meat, you could use lamb or beef in this recipe. 1. Cook the noodles as directed. Make at least 3 servings per package directions. 2. In a large skillet heat 1 tbsp oil. Add the onion and cook until soft. Add the carrots and green beans and cook until the carrots are bright orange. 3. Add the gyro meat and top with about 1/4 cup oil. *** Add the pasta to the skillet, and stir well. Simmer for 3-5 minutes with the lid on. Serve warm with feta cheese. *I made this a few months ago with dried garlic, basil, and oregano. Just throw the dried herbs in a sealed container of oil and let sit for a few hours before using. If you don’t have this or want to make it, just use regular olive oil and add some garlic, basil, and oregano to the pan. **Feta cheese usually comes in a chunk or crumbled. While the crumbled appears cheaper at first glance, it is usually twice as expensive when you look at the ounce price. Go for the chunk of feta and crumble it on your own to get more bang for your buck. 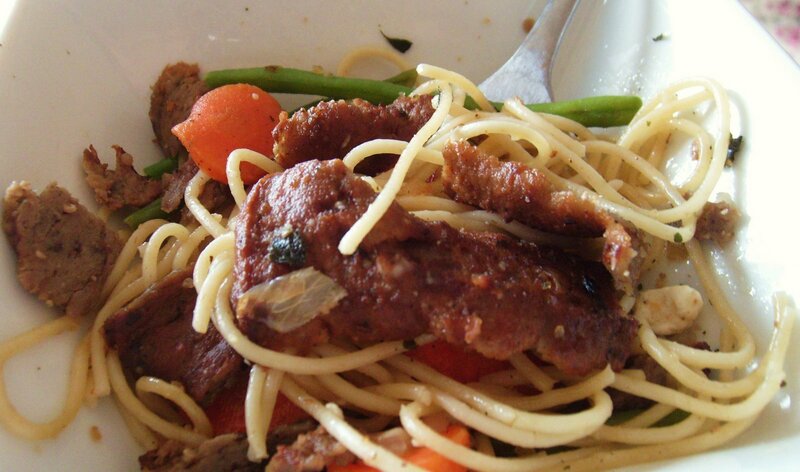 This entry was posted in Nutrition and tagged international, lamb, Meals. Bookmark the permalink.